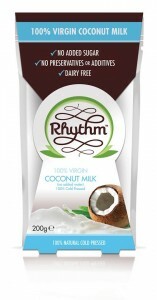 I love Rhythm Health‘s new coconut milk. It is like coconut cream that comes in a tin, but it tastes so much fresher. It is raw and 100% cold pressed. Plus it literally melts in the mouth as it still has all of the coconut oil left in in it. Yum! Kefir is a fermented drink, traditionally made with milk, that contains beneficial microorganisms, the ones that are good for the gut. 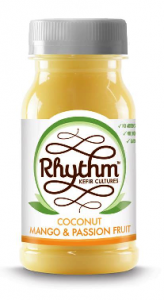 The new coconut kefir range are an amazing option for those who prefer not to have dairy. Check out my post on the health benefits of eating bio-live fermented foods. 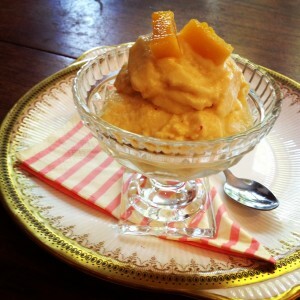 *Using chilli flakes results in slightly chewy, bursts of chilli in the ice cream. You could use chilli powder or fresh chilli for a more infused flavour if you prefer. Personally I like the flavour bombs! Pop all ingredients in a blender and whizz until smooth. Add to a ice cream maker and allow to freeze. This coconut ice cream doesn’t have any additives in and so is best eaten fresh as it will become quite icy in the freezer. If you do freeze it then it is best to freeze in portion-size containers and allow them plenty of time to thaw out before using. This entry was posted in Front Page and tagged Beneficial bacteria, Desserts, gut health, Water kefir. Bookmark the permalink.